In a Nutshell: Just as an individual generates a personal credit profile over the course of his or her financial life, so, too, does a small business. Unfortunately, building a commercial credit profile is much more difficult than building one as a consumer. Many small businesses can take five years or more to do so, making it nearly impossible for lenders to assess their credit risk and offer financing — even if they want to. 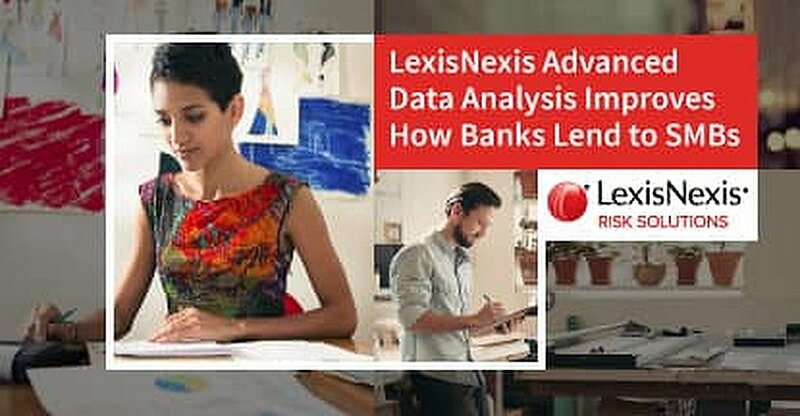 Data and risk analytics company LexisNexis Risk Solutions is helping bridge the information gap between banks and businesses by offering alternative-data-based credit risk assessments for lenders to make smarter, safer lending decisions. By using advanced analysis techniques, LexisNexis Risk Solutions can identify — and resolve — thousands of data footprints to establish a business’s profile, expanding beyond the lender’s reliance on traditional commercial credit reporting and increasing their ability to lend to more small businesses. In the eyes of the law, your small business is an entity; it exists — and, generally, pays taxes — as a thing that is separate from any individual person (though the extent of this will vary depending on the type of business). So, while your personal credit history can impact your business credit, your business can — and should — establish its own credit history. Unfortunately, your average small business either has what’s called a “thin file” — read: only one or two accounts — or, no credit history at all. In fact, according to Ben Cutler, Head of Small Business Credit Risk Decisioning for data and risk analytics firm LexisNexis Risk Solutions, only about half of small business financing applicants actually have an established credit profile, and of those, about one half are thin files. The problem? Ben says it’s two-fold. The second factor? The same thing that keeps regular consumers from establishing credit: fear of taking on debt. As with consumer credit, though, failing to establish a commercial credit history can bite you later. Without access to a credit profile to even establish that your business is real, most lenders can’t approve your application — even if they really want to. “These lenders want to lend,” stressed Ben. He said many lenders, particularly small business credit card issuers, have shown an increased willingness to lend, especially over the last few years, but are being curtailed, in part, by more extensive regulations and, particularly, by the lack of information. “If only about one in three of those small business applicants have a credit profile, you need to go out and look at other data sources.” That’s where companies like LexisNexis Risk Solutions are helping bridge the information gap, using advanced data analytics to establish alternative credit risk assessments of small businesses. The key to developing an effective profile of a small business isn’t necessarily all in the data — though LexisNexis Risk Solutions, which pulls from about 13,000 different sources, has plenty of that. The real trick, according to Ben, is to do something with that data. Developing a complete risk profile starts with alternative business data, which can be anything from your business’s articles of incorporation to your company’s power bill. Ben says the average small business can operate for five years or more before establishing a typical commercial credit history. While the initial steps taken by a fledgling business are important and necessary, they generally don’t help your new business establish credit. Even the initial inventory purchases or asset acquisitions won’t give your company a commercial credit score in most cases. They will, however, create a data “footprint” that LexisNexis Risk Solutions can find — and analyze. As with a traditional consumer credit analysis, LexisNexis Risk Solutions looks at things like on-time payments — and late ones — as well as the types of accounts and overall utilization. If a business, or the people associated with it, have had a bankruptcy or other negative event, it all comes out here. “We see around one out of three businesses have some type of derogatory experience in their background, or the background of the person associated with the business,” explained Ben. This process involves many of the same steps they use when collecting information on the business itself, including taking advantage of similar alternative data types. Ben described it as the same type of information that a business creates when setting up shop. The LexisNexis Risk Solutions’ Small Business Risk Score uses alternative data on the business and the people associated with the business to help give a complete profile of the business’s risk. So, how does all of this data and analysis actually affect your business’s ability to get a loan? Well, it turns out this (extremely) complex process actually has a simple goal. “When you think of these footprints,” said Ben, “a lot of times we’re just trying to answer five fairly basic questions.” And, it’s the answers to those questions that decide if you get financing from the lender using the company’s metrics. 1. Is the Company Real? 2. Is the Company Stable? Once they’ve established that your business is who you say it is, it’s time to start building the details. For each source, they’ll determine not just if you show up, but what they’re saying about you. They want to know if your business is stable — or struggling. 3. Can the Company Repay Its Debt? 4. Will the Company Repay Its Debt? Of course, there’s a world of difference between able and willing — and LexisNexis Risk Solutions can tell. They’ll delve both into your ability to pay, and how likely you are to do so. 5. Does the Company Have a Good Reputation? This step can also help indicate if the lender wants to lend to your business — or you. According to Ben, sometimes this step can reveal personal habits or questionable activities that would make a lender hesitant to work with a business. He gave an example involving a fellow caught participating in some illicit online behavior — and who was subsequently denied financing. While many lenders are still relying on commercial credit reports — and, thus, denying otherwise qualified applicants — there is still hope for the almost 80% of small businesses who have a thin file, or even a nonexistent one. According to Ben, lenders are finally starting to come around to the idea of alternative-data-based lending risk models. In fact, over the last two quarters, LexisNexis Risk Solutions has put together a full suite of small business credit assessment products that blend three data sources (traditional small business credit scores, financial payment history, and alternative data) and are making an impression on the industry. Ben shared a case study involving one of the top five small business lenders with particularly promising results. With only a 35% hit rate for traditional credit data, you’re left with thousands of applicants who could end up being risky bets — or could be missed opportunities. For card issuers, the missed opportunities are of particular interest, said Ben, because the first lender to bring in a customer will garner a larger wallet share and a more loyal customer. “We applied the alternative data and our score, and that took the [identification] hit rate from about 35% — up to over 80%. A huge increase in just the percentage points of the number of individuals we could identify,” described Ben. “Of course, just because we could identify them doesn’t mean that they’re all willing to repay, able to repay, and reputable.” The LexisNexis Risk Solutions team analyzed that 80% of applicants using traditional credit data and its alternative data to score each applicant. In addition to increasing the number of small business credit applicants who can not only be properly identified but accurately assessed for risk, LexisNexis Risk Solutions has been developing a better way for lenders to manage all of those new approvals through its new account monitoring solution. To do that, LexisNexis Risk Solutions created an automated product that looks at the activities of a small business using the same types of data as it does when doing an initial risk assessment. They see if the business has opened new accounts with other lenders, if it has delinquencies or charge-offs, changes in credit score, and more. According to the Small Business Association, more than 28 million small business are operating in the US alone — and they account for 54% of all US sales. Furthermore, the number of small businesses in the US has increased by a full 49% over the last 25 years. Of those millions of small businesses, only about a third have a traditional thick-file credit history, meaning millions of applicants are left on the cutting room floor when put through traditional credit risk models.